Each year, I try to create some sort of new and celebratory holiday dish, be it a casserole, a stew, a stuffing, or a pasta dish. In years past, it’s been shepherd’s pie, lentil and sweet potato loaf, or savory polenta stacks. 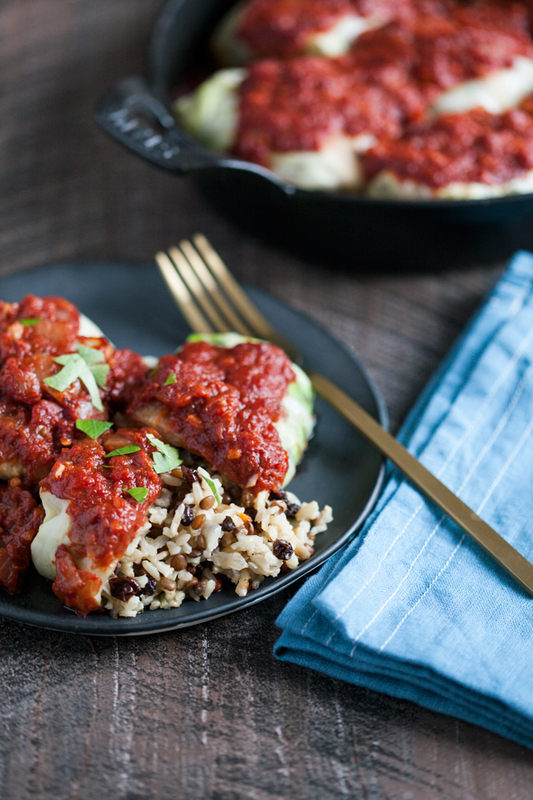 This year, it’s these delicious stuffed cabbage rolls with rice, lentils, and currants. 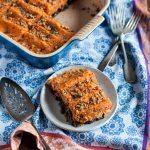 The dish brings back memories of one of the first celebratory vegan meals I ever made, and in spite of the fact that it demands a little elbow grease, the hearty, flavorful results are well worth the time you’ll spend creating it. Yep, this recipe is a little bit of a project. There are rice and lentils to cook, filling to prepare, cabbage leaves to boil and then to stuff. The work, though, pays off in the form of a filling meal that serves a crowd or leaves you with a lot of leftovers. I made it on Sunday, had it for lunch yesterday and today, and there’s still plenty to go. There’s a lot to be said for quick, easy, weeknight dinners, and come January, that’s my focus. During the holidays, though, it’s nice to create something that’s a bit of an undertaking, but oh-so-rewarding to savor. In the meantime, there are a bunch of shortcuts you can take when preparing this dish. I include my recipe for stress-free homemade marinara sauce, but you can use your favorite store-bought marinara instead. 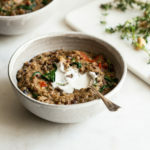 You should also feel free to use canned lentils for the filling, which will save you some time. 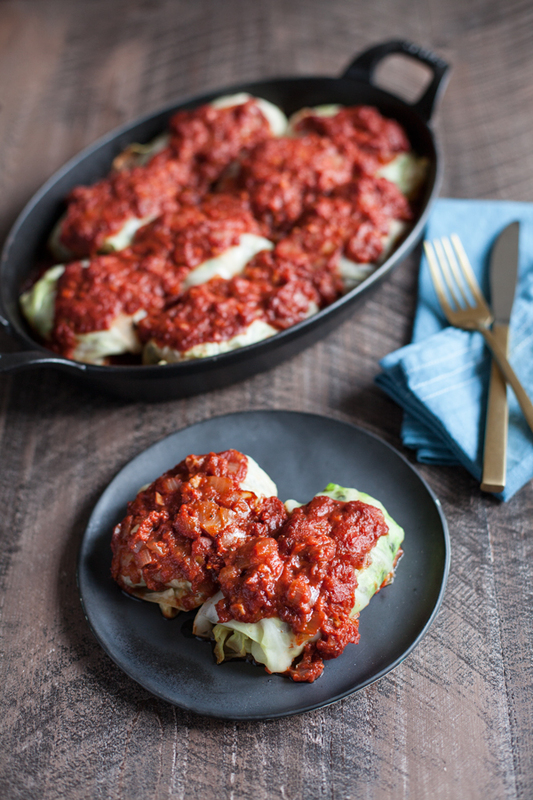 You can prepare the filling and the sauce (if you’re making it at home) a day in advance, so that all you have to do the day of serving is boil and trim your cabbage leaves, then stuff and bake. Whatever works for you! Quick note about preparing the cabbage leaves: if you try to peel whole leaves off the head of cabbage before boiling them, you’ll end up with a ton of torn leaves. Instead, the easiest way to get whole cabbage leaves is to submerge the whole head (stem attached and all) in boiling water, leave it there for a couple minutes, then rinse it under cold water. The outer leaves will slip off intact without any fuss, and you can keep repeating as needed. Once you have the leaves, you’ll want to treat them exactly the way you treat collard leaves for raw wraps: by using a paring knife to shave down the thick center rib. 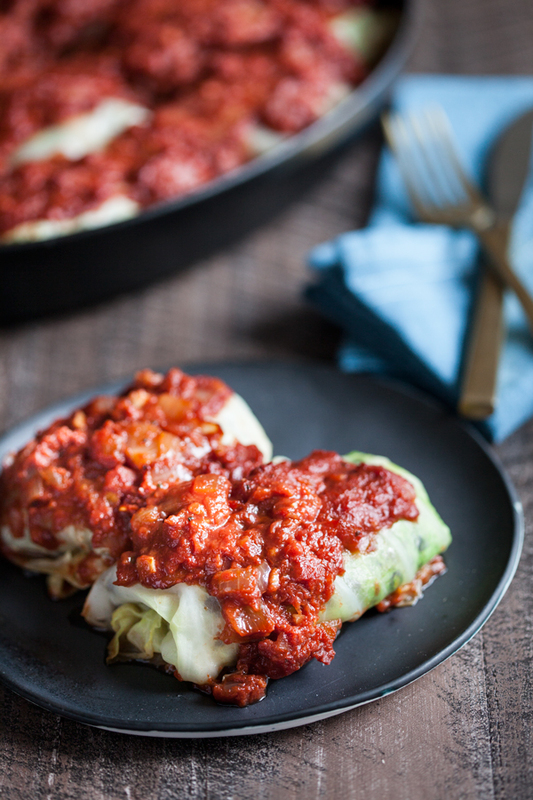 You can use this post as a tutorial, just substituting cooked cabbage leaves for raw collards. Don’t worry if it takes a few tries for your leaves to roll up neatly, and don’t worry if they’re perfectly rolled. This dish is meant to be rustic, and it’s all getting smothered in marinara and baked in the end, anyway! Heat the oil in a large sautee pan. Add the onions, along with a pinch of salt. Cook the onions for 5 minutes, or until they're soft. Add the carrots and celery. Cook for another 2 minutes. Add the rice to the pan. Toast the rice, stirring frequently, for a full five minutes; you want it to smell lightly toasted and fragrant. Add the 2¾ cups water and bring to a boil. Reduce to a simmer, cover the pan, and cook for 30-35 minutes, until the rice is tender. Stir in the lentils, ½ teaspoon salt, a generous dash of pepper, the cumin, the lemon juice, and the currants. Preheat your oven to 350F. Spread about a cup of the tomato sauce over the bottom of a 9x13 inch baking dish. 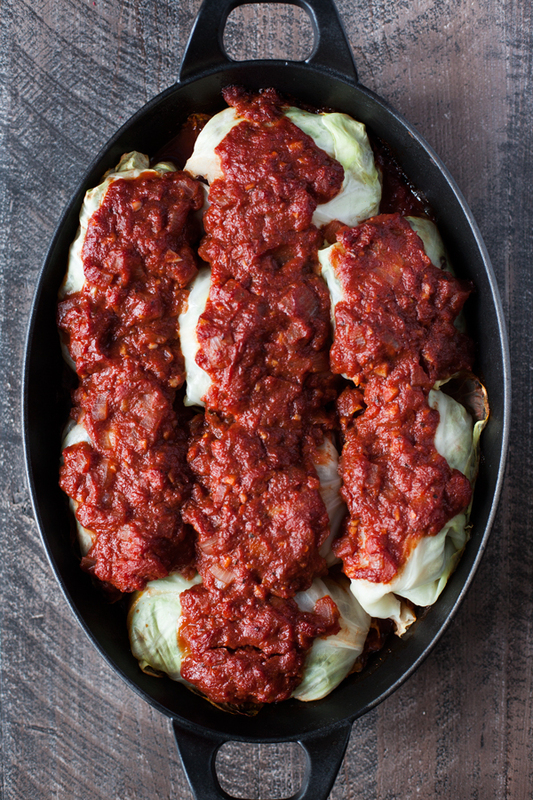 To prepare the cabbage rolls, bring a large pot of water to a boil. Submerge the whole head of cabbage in the water for 3 minutes. Use tons to remove the head from the pot, and run it under cold water. Slip the first few outer skins off; they should be very easy to remove in one whole piece. Return the cabbage to the pot for 2 minutes, and then repeat the process. Do this until you have 12 whole, par-boiled cabbage leaves. Pat the leaves gently to dry them, and reserve remaining cabbage to toss into salads or slaws. Use a paring knife to trim down the thick stems of the cabbage leaves--just the way you'd prepare collard leaves for raw wraps (tutorial here). Add a generous ½ cup of the rice lentil mixture to the center of the leaf. Tuck in the bottom and the top, and then fold one side over the filling tightly. Wrap the other side over and around the roll, making sure to keep things snug, and place the whole roll, seam side down, in the baking dish. Repeat with all twelve cabbage leaves. Top the leaves with the remaining two cups of tomato sauce. Bake the rolls for 30-35 minutes, or until the sauce is bubbly and darkened on top of the rolls. Remove from heat and serve. Leftovers can be stored in an airtight container for up to 4 days, or frozen for up to two weeks. Heat the olive oil in a medium large saucepan. Add the onions, along with a pinch of salt. Cook for 5-7 minutes, or until the onions are clear and tender. Add the garlic and cook for another 3 minutes, stirring constantly. Stir in the sugar. Add the tomatoes, tomato paste, oregano, thyme, and salt and pepper to taste. Keep warm till ready to use. Leftovers will keep in an airtight container for up to five days, and can be frozen for up to 2 months. 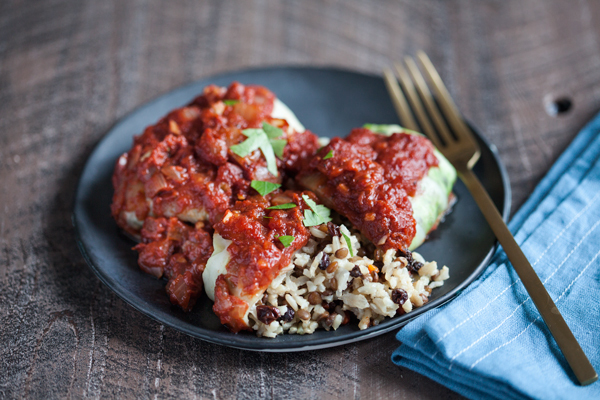 A little fun backstory: stuffed cabbage rolls are actually one of the first “fancy” vegan recipes I ever made at home. That version featured bulgar and raisins, but it had a similar combination of slightly Middle-Eastern flavors in the filling (cumin, lemon, currants) and a rich marinara topping. The first time I made it, I wasn’t sure that flavor combination would work, but I loved the way it turned out, and I still do. I remember distinctly my feeling of pride at looking at my rows of neatly stuffed cabbage leaves, and being so happy that I’d created something a little more ambitious than tofu scramble or brown rice stir-fry (my first vegan suppers). Years later, I’m still really smitten with this dish, and I’m so happy to have prepared it in time for the holidays. I hope you try and enjoy it, too. I can’t wait to try this! Thank you! Happy Holidays! This looks wonderful, great celebration of veggies in a gorgeous presentation. Thanks! I can’t wait to try these. They look heavenly! 🙂 Merry Christmas! I adore recipes like this! Looks so delicious. 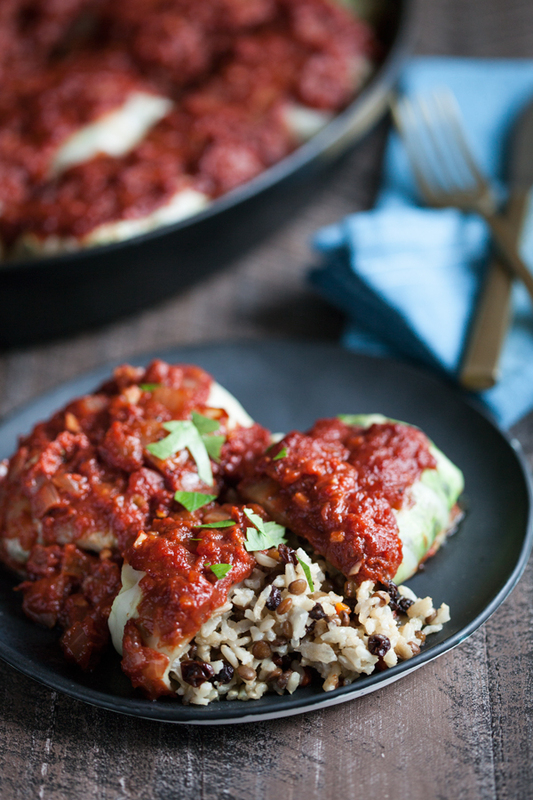 Can I freeze the finished stuffed cabbage rolls? The texture of the cabbage may change a little, but they should freeze pretty nicely for up to a month. I hope you enjoy them! Just made these last night and they got devoured by all, including my 5 and 7 year old and my diehard omni father-in-law. I was planning on adding more spices to the rice, didn’t think just cumin and lemon would be enough but those simple additions made it just delicious!